Today's web sites are moving beyond a set of pages displayed through a series of links (i.e. "Brochure-ware"). Instead, the browser is being used as the frontend to corporate applications. User's log in to the corporate site, get menus based on their permissions, receive pages that only exist at "run-time", and access a backend database for dynamic content. 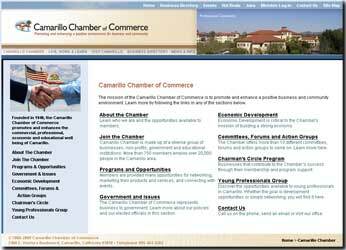 Founded in 1940, the Camarillo Chamber of Commerce promotes and enhances the commercial, professional, economic and educational well being of Camarillo (CA). 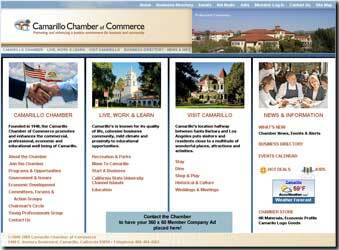 One of Gallaware's newest clients, the Camarillo Chamber of Commerce required a web site that is much more than an on-line brochure for the city. The challenge was to create an intuitive, visually pleasing and concise yet comprehensive interface for the vast amount of information they wanted to share with visitors to the site. We also needed to link their web site to a pre-existing Chamber of Commerce support site, providing seamless integration to such features as Event Calendars, Job Listings, Business Directory and Member Login. One other very important element we were able to implement for them was the capability for rotating banner ad spaces through-out the site, allowing their members to advertise their products and/or services. 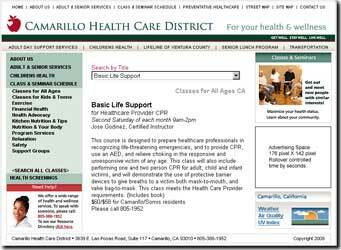 The Camarillo Health Care District is a public agency formed in 1969 by the voters of the Pleasant Valley (CA) and surrounding areas to provide community health, wellness and safety services. The District focuses on maximizing health and wellness through prevention, screening, education, support and direct services. 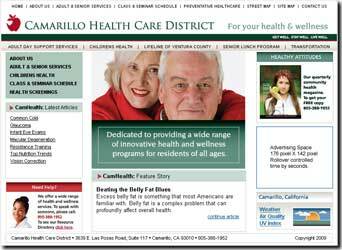 The aspect of the Camarillo Health Care District's site that makes it what Gallaware considers a "web application" rather than just a "web site" is it's connection to a database holding Class, Seminar and Health Screening information that a site visitor can search by Category and Title, then register for on-line. The information provided is dynamic in that we also created a backend database interface for the District to be able to add/edit/delete classes/seminar/screening information real-time, without having to continuously come back to the web developers every time changes are needed. Sage Alternatives, Inc (SAI) specializes in conducting comprehensive personal history interviews for Long Term Care Insurance. The company focuses on providing a clear picture of an applicant’s health, functional abilities and cognitive status so insurers can make an informed underwriting decision. 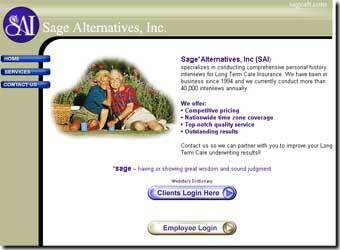 As Sage Alternatives, Inc. business steadily grew, they were in desperate need of major upgrades to an internet-based application that they had been using to organize the long term care insurance needs of their clients' potential customers. With personal health information needing strict privacy safeguards, security was a high priority. Gallaware provided SAI with a versatile application that supported: 1) remote interviewers' need to download their day's work and upload the collected data; 2) clients' ability to submit interview requests and view current requests status'; and 3) in-house administration's need for work assignment management, payroll and invoicing features and a wide variety of statistics reporting to help them better run their business. 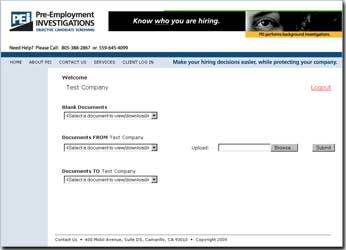 Pre-Employment Investigations, Inc. (PEI) provides the invaluable service of objective candidate screening for companies looking to hire new employees. 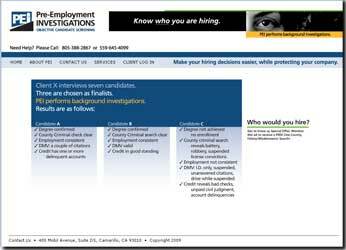 Thorough background checks covering DMV records, civil issues, education, credit, employment and criminal histories together offer a potential employer a complete and informed perspective of their applicants' suitability. In an attempt to help automate a traditionally very paper-oriented set of procedures, PEI looked to Gallaware to create them a simple yet secure file upload/download web application to aid in the exchange of information with their clients. Every client has a password-protected workspace on the encrypted web site to safely transmit and archive their confidential candidate applications and completed background check reports. 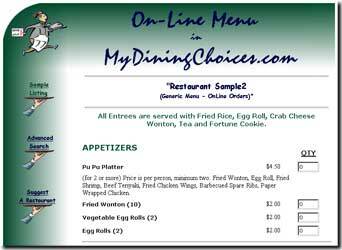 My Dining Choices (MDC) is a restaurant search engine, menu display and on-line ordering web site. In addition to the traditional Restaurant Name and City searches, this search engine enables the visitor to list restaurants by cuisine, entertainment, attire, ambiance, price range, special diets, accommodations, special services, and even outdoor facilities. Check out restaurants at your travel destination or find out who delivers when you can’t take time out of your busy schedule. 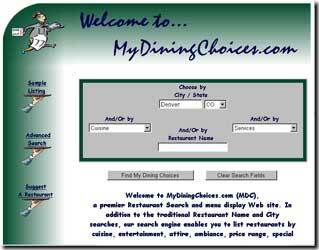 My Dining Choices had a unique idea long before the huge surge in so-called Restaurant search engines. MDC called on Gallaware, even when we were just a fledging company ourselves, to build an extensive web-based database interface. Capabilities included: restaurant searches based on a wide array of features; the ability for restaurants to enter in their own search criteria data based on a number of provided listing options; a review feature for MDC to verify restaurant information before including in the site's database; and on-line ordering for those restaurants tied in with email and/or faxing services.